There are a lot of terrible, addictive mobile games. It can be a particularly unhealthy market from time to time. 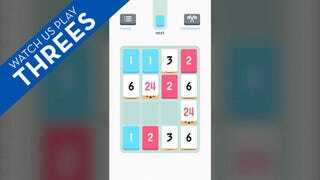 Which is why Threes is so fantastic. Sure, Threes (actual name: Threes!) is addictive, but it's so fun to play from moment to moment that I've never minded that I'm hooked. Kirk Hamilton also calls it "the sexiest game about numbers I've ever played." He's got a point. You can pick it up for two bucks today on iOS, or three bucks later on.